In the 3/15/19 update (see here), the IYR was projected to reach the 87 area as a measured move. IYR reversed just shy of that mark at 86.99. It’s interesting that we have a reversal in this index while at the same time, the long bond reached a new (post 11/2/18) reversal high with rates going down correspondingly. Which one is the weaker? The fact that IYR reversed perfectly at the measured target is probably a technical point only. Plenty of other traders saw the set-up and acted accordingly. 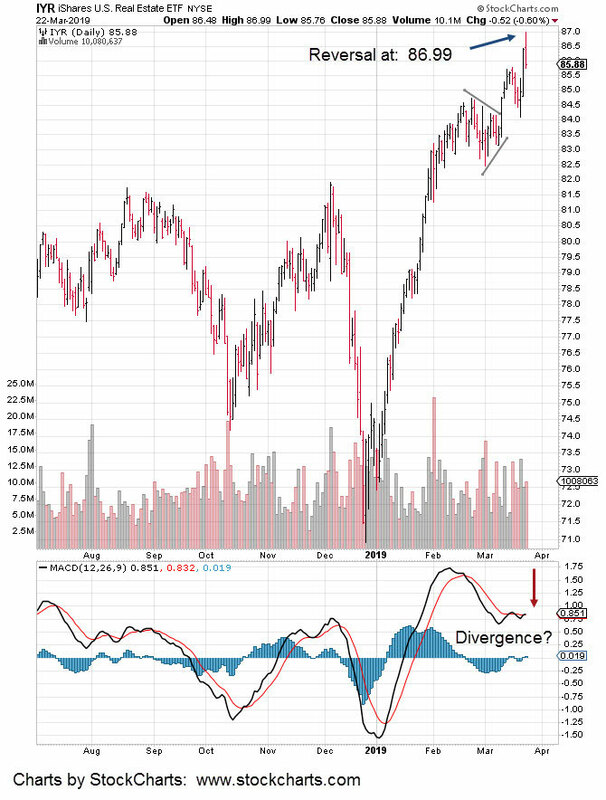 Note how the MACD divergence is ticking slightly higher. Not as weak as it looked earlier. So, the real story (and opportunity) may be in bonds; More on that in the next update. With real estate absolutely stretched, the professionals look like they're getting out. 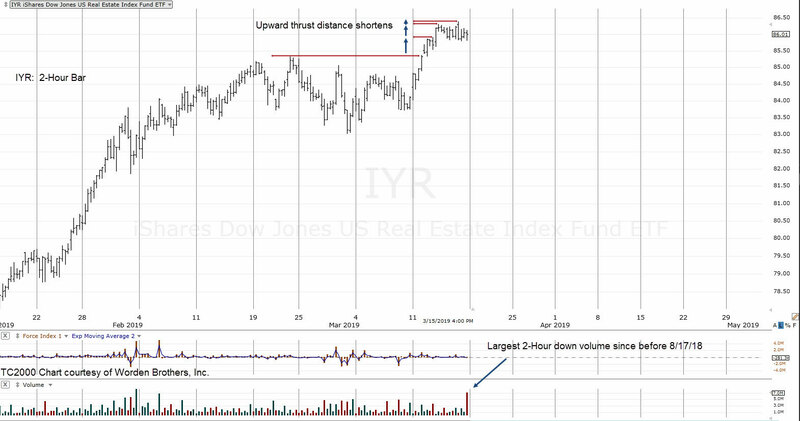 At the end of Friday’s session, the IYR had the largest two hour (down) volume as far back as we have data. All the way to August 17th of 2018. On top of that, it was the largest four-hour volume as far back as January 23rd of that year. If you look at the daily chart, the volume does not appear all that significant. It’s as if the pros are trying to hide their moves within the data. After all, who looks at two-hour and four-hour charts anyway? The real estate sector (IYR as proxy) may be in the last stages of its move off the December 26th lows. A wedge pattern typically occurs during the end of a move … either up or down. The measured move off the upside breakout is to the 87-area. 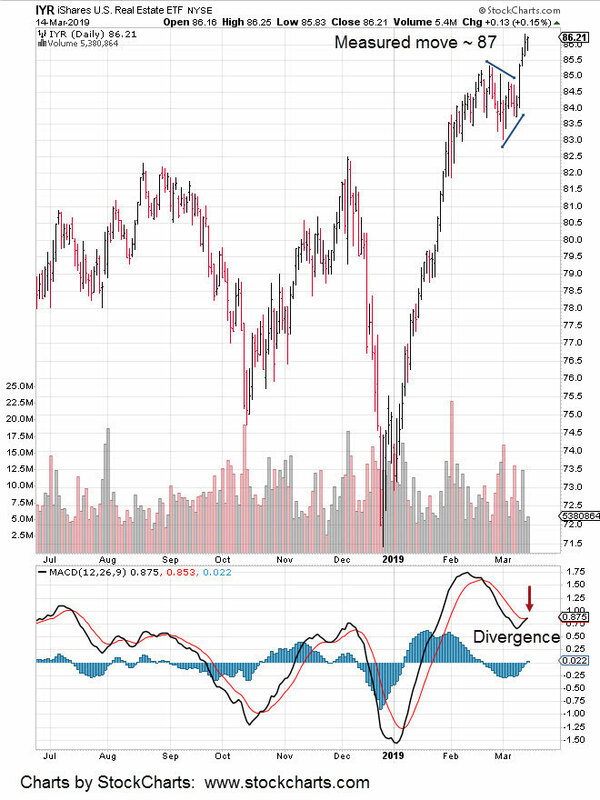 IYR is already posting a bearish daily divergence as seen in the MACD below the bar chart. If and when it reverses, initial support is 83 – 85 but after that, it’s a long way down to the next levels.